You can’t tell from the street, but this classic Alexandria brick duplex has a unique feature: a charming Caribbean-inspired outdoor living area perfect for entertaining friends and family. 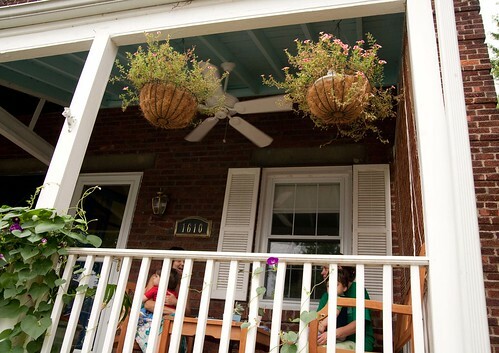 With just a few simple changes, Amy and John transformed their dark and sparse porch into a cool and relaxing space reminiscent of tropical vacations together. 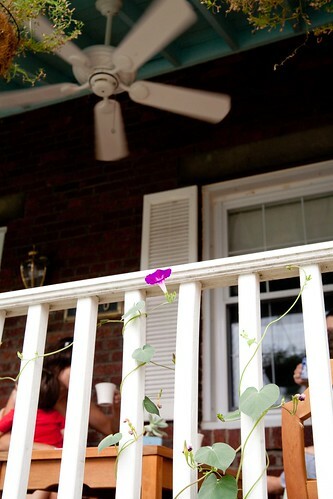 As you walk up to the house, you are greeted by lush morning glory vines. John planted the morning glories for two years in a row but this past year they came back by themselves. John and Amy selected the vibrant purple flowering vine because you get new flowers every morning and because they bloom in late summer when a lot of flowers are past their prime. Morning glory is also known to be fast growing and drought tolerant, another plus during those hot dry summer months. Amy noted they barely watered them this year and they grew better than ever. One of the first changes they made to the porch was to paint the ceiling (Ace Hardware Apple Creek A40-3). A friend mentioned that a lot of people in Savannah paint the porch ceilings sky blue. This really helped lighten up the porch. 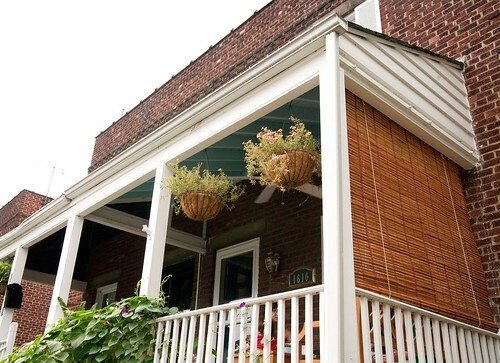 Check out their neighbor’s porch with the original unfinished ceiling. It’s rather dark and doesn’t have the tropical look John and Amy wanted. An added bonus is that the living room inside feels brighter too because the color reflects light. The side of the porch faces west so it bears the brunt of the hot afternoon sun. To make the room cooler and for added privacy, they installed bamboo blinds. They chose bamboo because it’s mold resistant and less expensive than other options. The blinds are from CSN Stores but purchased through www.Amazon.com (Oriental Furniture Burnt Bamboo Roll Up Blinds in Two Tone Honey). 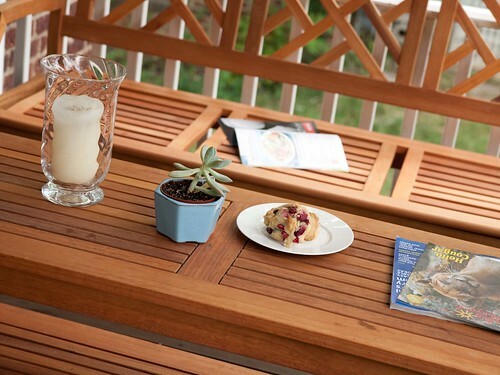 For furniture, they chose a Eucalyptus bench that seats three comfortably, an arm chair, and a 2-tiered coffee table. Eucalyptus is reputed to be as durable for outdoor use as teak, but less expensive. It’s also sustainable. They bought their pieces from www.Amazon.com (Vifah brand). The backs on Vifah’s Atlantic furniture are in a Chippendale style, specifically a style called “Chinese Chippendale,” which was popular in the U.S. in the late 18th and early 19th centuries, especially for furniture and balustrades. One of the best features of this porch is the ceiling fan. Cool breezes and no mosquitoes — what a difference that makes for your outdoor living experience! Installing the fan required assistance from an electrician as it had to be hardwired into the house (through the upstairs bedroom). They selected Becker Electric Company, Inc. (a local company on Gibbon Street) to help with this project. They chose a wet-rated fan as opposed to a damp-rated fan since the porch is open. The electrician recommended the wet-rated fan for its durability — and you can even hose it off! The fan is a Casablanca Lanai in Snow White. Compared to other fans, it has strong air flow, which is good for keeping you cool AND keeping bugs off you. They also used a 12-inch down rod so the blades wouldn’t hit the sloped ceiling. They bought the fan and down rod from www.hansenwholesale.com. With a little homework and a lot of effort, John and Amy added much-needed square footage and value to their home. They made smart, sustainable choices and consulted professionals when needed to create an enjoyable outdoor oasis for years to come. Bravo! 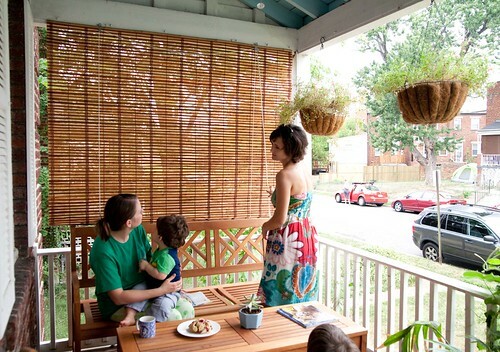 What improvements have you made to your outdoor space? Tell us in the comment space below or share on Facebook.